Varieties of JNKVV received 92.24 % indent at national level. It shows the popularity and wide acceptability of JNKVV bred varieties in most of the soybean growing regions of country. Previously JS 335 alone was a ruling variety. JS 93-05 released in 2002 became very popular among farmers and started replacing JS 335. JS 95-60 released in 2007, which has become very popular among farmers of low rainfall and upland areas. JS 97-52 a multiple resistant high yielding cultivar, recently released in 2008, is also becoming popular among farmers. These all varieties have served the purpose in breaking monoculturing. 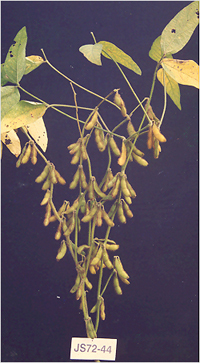 The soybean crop was on third position among oilseed crops after ground nut and rapeseed and mustard in the past. In 2002, it attained first rank and still continuing at same rank. The table depicts that from the year 2003-04, the coverage of JNKVV varieties was 73.86% whereas, it increased drastically in further years and ranged 85- 90%. Which shows the high acceptability and adoption of recently released JNKVV varieties by the soybean growers. In spite of producing more than indented quantities of breeders seed during favourable years in the country, the seed replacement rates were low. This was mainly due to the low seed multiplication rates (SMR) and also due to rejections of seed crop or seed lots. Conscious seed production of soybean varieties is another priority area so that farmers can harvest the benefits of recently identified varieties for release. The breeder seed produced at JNKVV is given below. 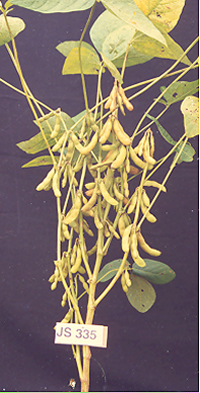 There has been an increased trend of seed replacement rates upto extent of 35% of Jawahar series of soybean varieties. A substantial foreign exchange of Rs. 7000 crores per annum is being earned by Govt. of India.The agro-based employment opportunities have created new avenues with soybean farming and industry. That has led to the substantial upliftment in the socio-economic status of farmers, traders and cultivators. 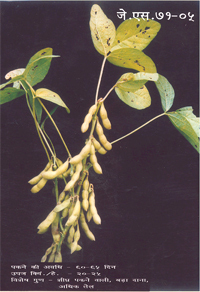 JS 2: This was the first variety of soybean developed from Tehri Garhwal material adopting Pure Line Selection which is early maturing. This became very popular among farmers. However, farmers faced problem of shattering and germination with this variety. JS 72-44 (Gaurav) : The real break through in soybean came after the evolution of medium duration soybean variety JS 72-44 (Gaurav) for cultivation in M.P. Gaurav having wide adaptability and higher yielding potential than any of the varieties of that time made renaissance and advent of soybean revolution. Gaurav was able to replace other varieties. 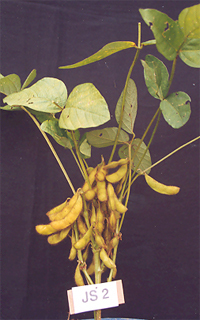 This variety was not management responsive and further became susceptible to several diseases. 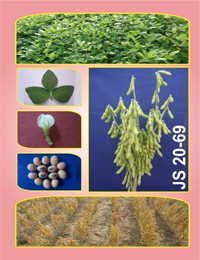 JS 72-280 (Durga) : This another important medium duration variety of soybean was developed in the name of Durga. This has got adaptability for specific situation and performed high yield, better plant stand and tolerance against viral complex. 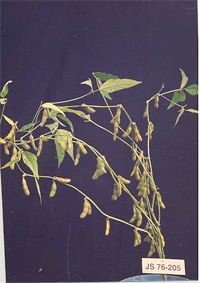 This variety was not management responsive and further became susceptible to several diseases. JS 75-46 : Another desirable variety JS 75-46 was released which out yielded all the previous varieties having non shattering, non lodging, high oil content characters and responsive to better management. This is also medium duration and good for mechanical harvesting. Due to poor field emergence in moisture stress conditions and susceptiblilty to several diseases, this variety could not sustain longer. 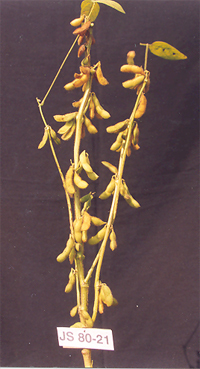 JS 76-205: This black seeded soybean variety was released for cultivation possessed good germinability and longevity. This variety was adaptable to even poor and low input conditions. This was suitable to Hosangabad and Mandla districts and scattered pockets of Kymore-Satpura plateau. It is shattering prone and further became susceptible to several diseases. Due to black seed not accepted by the market. JS 71-05: It is an early duration variety most suitable for Malwa condition and other areas of light soils and less rainfall. It replaced JS 2 variety which was highly shattering type. This is resistant against stem fly. The germinability was poor and further became susceptible to several diseases. JS 80-21: This variety was found superior to pervious varieties. The important characteristics of this variety were that it possessed good germinability and longevity and resistance to defoliators. This is also a medium duration variety. Further became susceptible to lodging, root rot and YMV. 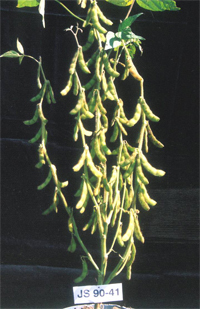 JS 335: The soybean cultivation reached to its height with the release of this early duration and very high yielding variety. It possesses wide adaptability, good germinability, semi dwarf habit, non lodging, non shattering characteristics. It has resistance against girdle beetle and stem fly and tolerance to moisture stress conditions. 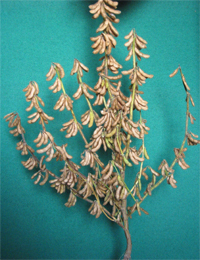 This has occupied most of the soybean growing areas created monoculturing. However, it has became susceptible to several diseases and insect - pests. 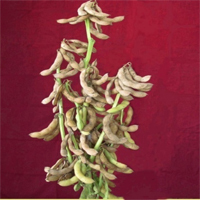 JS 90-41: The special character of this variety is that it bears four seeded pods. It keeps high yielding ability with resistance/tolerance to major biotic stresses. Due to its earliness and wide adaptability this became fastly popular among the cultivators. Further became susceptible to root rot and YMV. Due to greenish seed not accepted by the market. 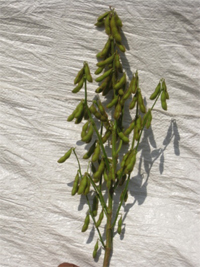 JS 93-05: The special character of this variety is that it bears four seeded pods. It has glabrous leaf, stem and pods. It keeps high yielding ability with resistance to root rot and tolerance to major biotic stresses. Due to its earliness and wide adaptability this has become soon popular among the cultivators. However, it is susceptible to YMV. JS 95-60: This is an extra early culture matures in 82-88 days. This also bears four seeded pods. It is suitable for specific situations like low rainfall, uplands and cropping sequence system. It has been found escaping of terminal drought conditions. It is resistant to root rot and tolerant to insect pests and abiotic stresses. It has been found superior to several early cultures. However, it is susceptible to YMV. 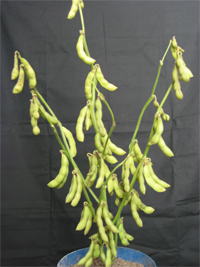 JS 97-52: JS 97-52 is a wide adaptable, high yielding and multiple resistant variety. The yielding potential of this variety is 25-30 q/ha. It possesses excellent germinability, field emergence and longevity during storage. It maturity period is 98-102 days, categorized as medium duration. It has been found resistant to YMV, root rot, bacterial pustules, charcoal rot, Cercospora leaf spot and target leaf spot and rated as resistant high yielding on the basis of reaction to disease complex. Similarly, it has been rated as resistant high yielding against insect pests on the basis of tolerance shown against stem-fly, girdle beetle and defoliators. JS 20-29 Early maturing, high yielding, high germinability, multiple resistant, tawny pubescence, medium pod colour, medium tall, flower colour white, bold seed, Hilum colour dark black. It ranked first in Central Zone recording 2406 kg ha-1 yield over 12 locations and recorded 14 % more yield than the best check JS 97-52 (2165 Kg ha1). It is an early duration culture matures in 94 days having bold seeds (13g per 100 seed weight). 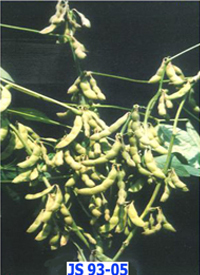 JS 20-34 Extra early, thermo-insensitive, high germinability, multiple resistant, dwarf, glabrous, pod colour light, It is an extra early culture ranked sixth recorded 2204 kg ha-1 yield which is 14 % more than that in early check JS 93-05 (1934 Kg ha-1) and 1.8% more yield than the best check JS 97-52. It is a dwarf thermo-photo insensitive having medium seeds (12g per 100 seed weight).